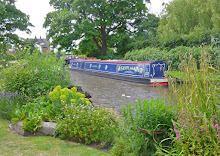 This blog is about life on board our narrowboat Sanity Again, cruising the inland waterways of the UK (mainly in the spring, summer and autumn) and living in a marina in the winter. It's the way I choose to write it; if you don't like it, there are many other boating blogs. After a lazy start this morning, I set to and did some stuff to help Des with his sterling work on the new Braidbar site. That all went just fine, so I did some other bits and pieces on the Mac Mini while I had it going. Sheila had the laptop booted as well, to do some banking and related tasks, so it was quite a session dedicated to IT. After this we ambled round to the office to hand in a letter to go in the outgoing post and looked in at Midland Chandlers on the way back. The fire extinguishers are due for replacement and we wanted to figure which of various discount options would be best. As it turned out, they presently have a deal whereby you can trade in the old extinguisher for a fiver off the new one, a saving of 25% and the best on offer. Otherwise, the Freaky Friday coming up soon would have been good with 20% off. We had time to have lunch before they returned, Sal still trying to bounce but now very tired. After a good chat, off they went and we took our extinguishers along to change. It's recommended that you change them every five years, as the powder tends to cake down in the cylinder so that not much comes out when you use it. Naturally, the new beasts don't fit the old holders, so that's a job for tomorrow. Just as we got back, David from Critical Point, tied just down from us, came along for a chat. He's a follower of this blog and has just been blogging about his own trip here. Glad you commented on the extinguishers. Following our conversation I looked on Ebay and could get them for £12.95 each, postage free. However I then thought, what do I do with the old ones? On balance perhaps MC is the better bet even at the higher price. © Bruce Napier. Watermark theme. Powered by Blogger.